The Virginia Department of Transportation has decided on the bored-tunnel method of construction for the up to $3.8 billion Hampton Roads Bridge Tunnel project, and both contractors competing for the job have used the method in putting together their bid proposals, according to a department press release. This is the first time a department project will use a bored tunnel. The department's previous tunnel projects have used the immersed tube method, by which crews install prefabricated pieces of tunnel into a dredged trench in the riverbed. This was deemed one of the few tunneling options because of the area's soft soils, but boring technology has advanced to the point that modern tunnel boring machines will be able to make their way along the tunnel path with less damage to the environment than using the immersed tube method. Boring the tunnel will also allow military and commercial shipping activity to continue with fewer disruptions during construction. The Chesapeake Bay Bridge-Tunnel Commission also chose the boring method for the $756 million Parallel Thimble Shoal Tunnel, now underway at the Chesapeake Bay Bridge-Tunnel. The VDOT expects to award the Hampton Roads tunnel contract in early 2019 to either the Hampton Roads Capacity Constructors or Hampton Roads Connector Partners private-sector team. Despite all of the advances in tunnel boring technology, Elon Musk's The Boring Co. is attempting to up the industry's game. The company's stated goal is to be able to increase machine speed and efficiency and cut tunneling costs by a factor of 10. 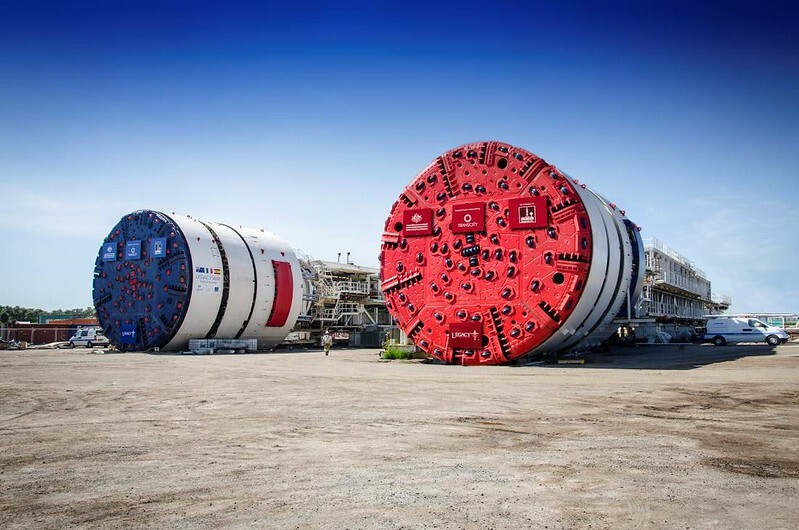 The Boring Co. suggests tunneling machines can be made to go faster by increasing the machines' power threefold; continuously tunneling rather than stopping to erect support structures; automating tunnel boring machines and replacing diesel locomotives with electric ones. The Boring Co. will be able to test out its theories on its first contract award, an express train from downtown Chicago to O'Hare International Airport. The Boring Co.'s proposal is for an underground twin-tunnel design that will use a system of electric vehicles traveling at more than 100 miles per hour. The company plans to use an unfinished underground transit station downtown and construct a new station at the airport. A budget and schedule must still be submitted to the city council for review and approval, even though the project won't cost Chicago taxpayers a dime, as The Boring Co. will design, build, operate and maintain the line.